Baiocchi, T. and Dillman, A. R. (2015). Chemotaxis and Jumping Assays in Nematodes. Bio-protocol 5(18): e1587. DOI: 10.21769/BioProtoc.1587. Nematodes have sensitive olfactory perception, which is used to detect and differentiate many volatile odorants. Some odorants are attractive, others repulsive, and yet others evoke no particular response. Chemotaxis assays can be used to determine the role of certain odors in many different behaviors including foraging, predator avoidance, and mate attraction. In addition to chemotaxis, some species of nematodes in the entomopathogenic genus Steinernema can jump, which is thought to play an important role in host-seeking and dispersal (Dillman and Sternberg, 2012). Jumping and chemotaxis assays have been successfully used to identify odorants that stimulate these behaviors in a variety of nematodes (Bargmann et al., 1993; Campbell and Kaya, 1999; Hallem et al., 2011; Dillman et al., 2012; Castelletto et al., 2014). Here a detailed protocol for chemotaxis and jumping assays is provided based on the growing body of literature. Note: The Caenorhabditis Genetics Center (CGC) is a great resource for many commonly used nematodes (http://cbs.umn.edu/cgc/home), but not all nematodes are available through this resource. For example, entomopathogenic nematodes (EPNs) are not available through the CGC and either need to be collected from field sampling or requested from another researcher’s lab. Drilling two 3.05 mm holes in a 10 cm petri dish lid, each hole should be 1 cm from the edge along the diameter, exactly opposite each other. Prepare one lid for each assay that will be done simultaneously, but once prepared, lids can be reused. Attach flexible PVC tubing (1/8 inch inner diameter) to the top of each hole, with the tubing projecting slightly into the inside of the lid (Figure 1A). The end of the PVC tubing going into the plate lid may be wrapped with layers of parafilm to insure a tight fit. The other end of the tubing will be connected to a 50 ml gastight syringe (Figure 1B). The bottom of the assay plates should have the scoring template attached (Figure 2). The scoring template can be printed on transparency film and attached to the assay plates using small strips of double-sided tape. 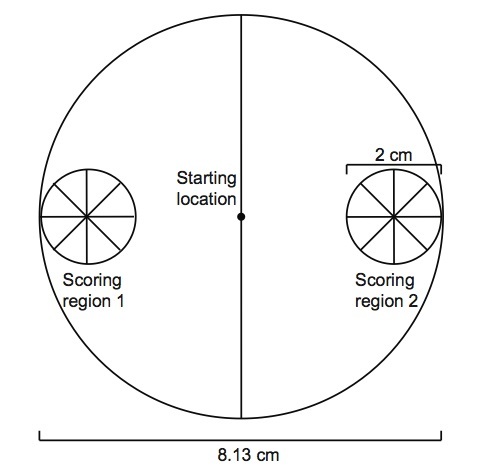 Scoring regions are 2 cm diameter circles on each side of the plate along the diameter, with the center of the circle 1 cm from the edge of the plate. Nematodes can be prepared by first adding 1-2 µl of 20% TritonX-100 in water solution to the bottle in which they are contained. The nematodes can then be quantified by placing five 10 µl drops onto a petri dish lid. The nematodes present can be counted and the density of nematodes in the solution can be calculated. A volume sufficient to obtain the number of nematodes desired can then be placed into an Eppendorf tube and allowed to rest for 2 min or more. The nematodes will sink to the bottom and the excess water can be aspirated. The pellet of worms can then be extracted via pipette. Immediately prior to starting the assay, fill the 50 ml gastight syringes according to the experiment. For example, if evaluating the attraction of 10% CO2, one syringe will be filled with 10% CO2 while the other syringe will be filled with the air control. The syringes will be depressed at a rate of 0.5 ml/min using a syringe pump (e.g. PHD 22/2000, Harvard Apparatus) for the duration of the assay. Place approximately 5-10 µl of worm pellet containing ~50-150 nematodes in the center of the assay plate. These nematodes should be stage-matched or synchronous if possible. Different life stages are known to change in their odor preference (Hallem et al., 2011). Each plate should be undisturbed - on an anti-vibration platform - for the duration of the assay. These assays can be run for variable lengths depending on the specific experiment being performed. One hour seems to be standard but it has been shown that 10, 20, 40, and 60 min can yield the same result in some experiments (Hallem et al., 2011). Host headspace can be tested by placing a number of hosts inside a 50 ml gastight syringe; the number will vary depending on host size. The attraction of the host headspace can also be tested without the presence of host-produced CO2 by adding a column of soda lime into the assay setup (Figure 1C-D). A six-inch column of Nalgene (8050-0250) FTP 3/16” ID tubing can be filled with 2-5 mm soda lime pellets (Figure 1C). The column is fitted on one end with fitting 731-8226, which can attach to the tubing that runs to the assay plate lid while on the other end of the column is attached to fitting 731-8223 from a low-pressure fittings kit. That end should fit snugly onto the Luer-Lok end of the 50 ml syringe (Figure 1D). The fittings can be wrapped in Teflon tape to ensure an airtight fit. In this example the odorant being tested was CO2 while room air is the control, but the same calculation would be used for other odorants, though the control might be different. Assays should only be scored if ≥3 worms moved into the scoring regions, and trials from assay sessions in which all worms exhibited the same directional bias should be discarded. The assay as described is meant to be used as a population assay, with ~50-150 nematodes in the experiment but can be used for single nematode experiments. For odorant chemotaxis assays, place 1 μl of 1 M sodium azide in the center of each scoring region as an anesthetic. Place 5 μl of odorant in the center of one scoring region, while placing 5 μl of a control (either paraffin oil, dH2O, or ethanol) in the center of the other scoring region. As with the gas assays, place ~2 µl of worm pellet containing ~50-150 nematodes in the center of the assay plate. Leave the assay plates undisturbed and score them after either 1 h (for host and CO2 chemotaxis assays) or 3 h (for odorant assays). An alternative assay could be done without the use of sodium azide where assay plates are scored immediately after the allotted experimental time has passed. The odorant assay can also be done without an anesthetic, but then plates would need to be scored immediately after the experiment finishes. Figure 1. Chemotaxis assay setup. A. A picture of the 10 cm assay plate lid with two 3.05 mm holes in it. Each hole is 1 cm from the edge along the diameter, exactly opposite each other. The 1/8 inch I.D. PVC tubing is wrapped in parafilm and then fit into the holes. B. A picture of the 1/8 inch tubing attached to a gastight syringe. C. A picture of the soda lime column, constructed using Nalgene (8050-0250) FTP 3/16” I.D. tubing with low-pressure fittings on either end. In the picture, the column is empty but in the assay would be filled with 2-5 mm pellets of soda lime. 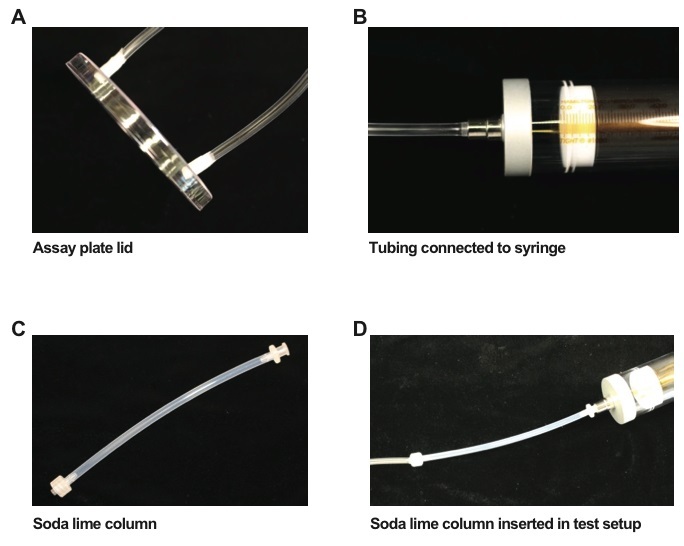 D. A picture of the soda lime column attached to a gastight syringe and the PVC tubing that connects to the assay plate lid. Figure 2. A template used to score chemotaxis assays. Nematodes are placed in the starting location at the beginning of the assay and their attraction to chemical odorants is evaluated as the nematodes distribute in the assay arena. As an extension of the chemotaxis assay, an alternative template can be used to score the nematodes for both the chemotaxis index and a proclivity for chemotaxis index (PCI). The PCI template (Figure 3) can be printed on transparency paper and attached to assay plate with double-sided tape. During scoring the number of nematodes found in each circle should be recorded as normal. Then, each region should be scored and the number of nematodes in each region should be recorded. The data can then be used to calculate the percentage of the population in each region. Figure 3. A template used to score chemotaxis assays for both chemotaxis index (CI) and proclivity for chemotaxis index. Nematodes are placed in the starting location at the beginning of the assay and their attraction to chemical odorants is evaluated as the nematodes distribute in the assay arena. 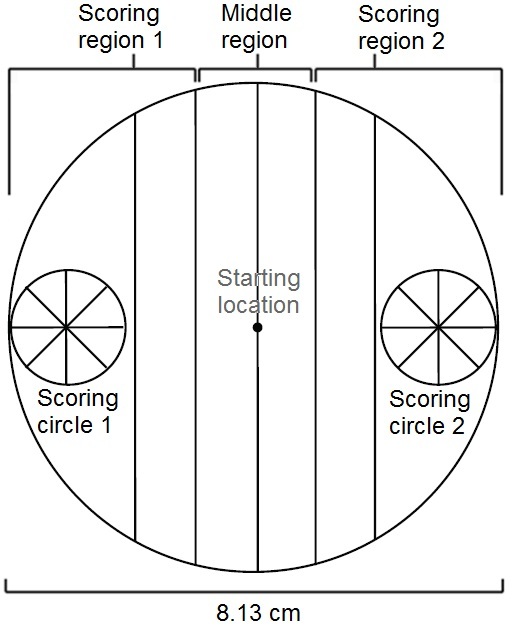 Evaluation in this case consists of both scoring circles as well as each respective region: Region 1, Middle region, and Region 2. 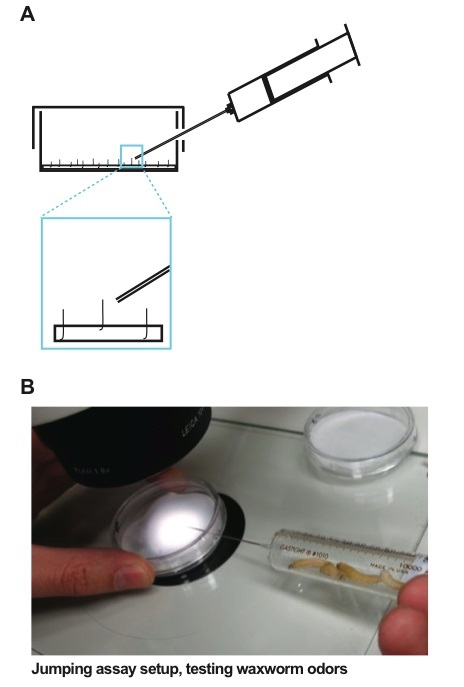 Drilling a 1.25 mm hole through the side of a 5 cm petri dish and lid to allow odors to be introduced with the lid on, thus preventing drying or the confounding effects of drafts (Figure 4). Place a 55 mm Whatman 1 filter paper on the bottom of the dish to absorb and retain moisture while providing a fibrous material to facilitate jumping. The filter paper acts as a soil-like substrate. Add < 100 nematodes suspended in ~200 μl of tap water. Introduce gases (e.g. 10% CO2) using a 10 ml Hamilton gastight syringe equipped with a Hamilton blunt needle (22 s/2”/3) (Figure 4). Introduce other odors (e.g. insect headspace or odorants) using a 10 ml Luer-Lok Becton Dickinson syringe with a Becton Dickinson needle (21 gauge 1.5”) with the end clipped to be blunt. Nematodes in the genus Steinernema were first observed to be capable of jumping in Reed and Wallace (1965). This was the first observed instance of jumping among nematodes and certain species of Steinernema remain the only nematodes known to be capable of jumping. It was shown that S. carpocapsae can jump an average of 4.8 + 0.8 mm (nine times it’s body length) and an average height of 3.9 + 0.1 mm (seven times it’s body length) (Campbell and Kaya, 1999). Jumping is an unusual behavior for a soft-bodied, limbless, invertebrate. For host-evoked jumping, the number of hosts inside a syringe could vary, depending on the size of the host (Dillman et al., 2012). The attraction of the host headspace can also be tested without the presence of host-produced CO2 by adding a column of soda lime between the syringe and the needle. A six-inch column of Nalgene (8050-0250) FTP 3/16” OD tubing can be filled with 2-5 mm soda lime pellets (Figure 1C). The column is fitted on one end with fitting 731-8226, which accommodates the needle and on the other with fitting 731-8223 from a low-pressure fittings kit. The fittings can be wrapped in Teflon tape to ensure an airtight fit. For odorants, place a small piece of filter paper in the syringe and place 5 μl of undiluted odorant onto the filter paper. The control assay should be done using the same diluent that was used for the odorant (e.g. paraffin oil, water, or ethanol). Cover the hole drilled into the dish with parafilm and punctured only during assays. Only infective juveniles (IJs) of certain species of Steinernema insect-parasitic nematodes are known to jump (Campbell and Kaya, 2000). Add nematodes to the prepared jumping arena in liquid suspension such that ~100 nematodes are suspended in approximately 200 μl of water. Evenly distribute the nematode suspension on the filter paper. This assay can be used for single nematode jumping by placing a single nematode in the middle of the arena by pipetting through a pulled glass capillary. Pre-moisten the filter paper with 200 μl of tap water. To examine odor-evoked jumping, randomly select standing individual nematodes and present them, one at a time, with a small puff (~0.5 ml volume) of either air control or volatile stimulus. Only test individuals once during a standing bout. While it is possible for individual nematodes to jump more than once, often they will adhere to the lid of the plate after jumping and it is unlikely that the researcher will test a nematode that has already jumped. Introduce the odorant by slowly bringing the syringe needle tip to within ~2 mm of the standing individual and delivering a small puff of the mixture in the syringe (~0.5 ml volume) (Figure 4). Observe and record the behavioral changes of standing individuals within an 8 sec response interval after presenting the cue. Responses can be scored using a binary criterion of whether or nor the individual jumped or it can be divided into more categories if desired (Dillman et al., 2012). Calculating the response in this way will result in a normalized J.I. that ranges from -1 to +1. Approximately 20 IJs can be tested from the same arena. As with the chemotaxis assay, a soda lime column can be used to remove host-produced CO2. In the jumping assay a 2 inch column of Nalgene (8050-0250) FTP 3/16” OD tubing containing 2-5 mm soda lime pellets. This column can be attached to the syringe using fittings from a low-pressure fittings kit. Fitting 731-8226 can attach to the needle while the other end of the column is attached to the syringe with fitting 731-8223. That end should fit snugly onto the Luer-Lok end of the 50 ml syringe (Figure 1D). The fittings can be wrapped in Teflon tape to ensure an airtight fit. Alternatively the column can be placed between 2 female-ended Swagelok compression fittings of the appropriate size (Dillman et al., 2012). Figure 4. Jumping assay setup. A. A diagram of the jumping assay. A 5 cm petri dish and lid have a 1.25 mm hole drilled through the side to allow odors to be introduced with the lid on, thus preventing drying or the confounding effects of drafts. A 55 mm Whatman 1 filter paper is on the bottom of the dish to absorb and retain moisture while providing a fibrous material to facilitate jumping. B. The odorant is introduced by slowly bringing the syringe needle tip to within ~2 mm of the standing individual while a small puff of odorant is delivered (~0.5 ml volume). These experiments can show some variability and are highly sensitive to changes in temperature, humidity, and the introduction of transient odors (e.g. perfume, cologne, soap, food, etc.) I have noticed that foods being cooked or eaten nearby, especially fragrant food such as popcorn, which smells like the attractant diacetyl, can affect chemotaxis and jumping behavior. Because of the high sensitivity and variability of these behavioral assays it is important that test runs and controls are run in parallel, using the same conditions. Having many replicates can help increase the behavioral signal. Although behavioral experiments tend to have high sensitivity and variability, I have found that observed phenotypes using these techniques are robust over many days of experiments and between different batches of nematodes, both for jumping and chemotaxis, though there are occasional batches with unusual behavior. The proclivity for chemotaxis assay is an interesting extension of the regular chemotaxis assay that provides more data and finer resolution into chemotaxis behavior. While previous work shows high chemotaxis indices for several species, which leads the reader to conclude that the species have similar chemoattractive preferences and abilities (e.g. Hallem et al. 2011; Dillman et al. 2012), a PCI assay might reveal differences in the proclivity for chemotaxis between these species. For example, whereas Steinernema glaseri and S. carpocapsae may both have a high CI toward waxworm odors, perhaps only 20% of the S. carpocapsae population being tested participates in the behavior while 80% of S. glaseri may be participating. The PCI is another way to explore the behavioral ecology of nematode olfactory responses. This laboratory protocol is a free adaptation of various published and unpublished protocols and has evolved over time (Ward, 1973; Bargmann et al., 1993; Campbell and Kaya, 2000; Hallem et al., 2011; Dillman et al., 2012; Castelletto et al., 2014). A.R.D. was funded by initial lab startup funds from the University of California, Riverside. Campbell, J. F. and Kaya, H. K. (1999). How and why a parasitic nematode jumps. Nature 397: 485-486. Campbell, J. F. and Kaya, H. K. (2000). Influence of insect-associated cues on the jumping behavior of entomopathogenic nematodes (Steinernema spp.). Behavior 137: 591-609. Castelletto, M. L., Gang, S. S., Okubo, R. P., Tselikova, A. A., Nolan, T. J., Platzer, E. G., Lok, J. B. and Hallem, E. A. (2014). Diverse host-seeking behaviors of skin-penetrating nematodes. PLoS Pathog 10(8): e1004305. Dillman, A. R. and Sternberg, P. W. (2012). Entomopathogenic nematodes. Curr Biol 22(11): R430-431. Dillman, A. R., Guillermin, M. L., Lee, J. H., Kim, B., Sternberg, P. W. and Hallem, E. A. (2012). Olfaction shapes host-parasite interactions in parasitic nematodes. Proc Natl Acad Sci U S A 109(35): E2324-2333. Hallem, E. A., Dillman, A. R., Hong, A. V., Zhang, Y., Yano, J. M., DeMarco, S. F. and Sternberg, P. W. (2011). A sensory code for host seeking in parasitic nematodes. Curr Biol 21(5): 377-383. Reed, E. M. and Wallace, H. R. (1965). Leaping locomotion by an insect-parasitic nematode. Nature 206: 210-211. Ward, S. (1973). Chemotaxis by the nematode Caenorhabditis elegans: identification of attractants and analysis of the response by use of mutants. Proc Natl Acad Sci U S A 70(3): 817-821. How to cite: Baiocchi, T. and Dillman, A. R. (2015). Chemotaxis and Jumping Assays in Nematodes. Bio-protocol 5(18): e1587. DOI: 10.21769/BioProtoc.1587.